Despite a preliminary injunction and an unwilling partner standing in the way, Anthem is still clinging to the possibility of closing its $54 billion merger with Cigna by settling with a new Justice Department under the Trump administration that it hopes will cut it some slack and greenlight the deal. Last week, Anthem won a temporary restraining order in the Delaware Court of Chancery to keep Bloomfield, Conn.-based Cigna from terminating its agreement to merge with Anthem. Transcripts from a teleconference held Feb. 15 between the two insurers and J. Travis Laster, the judge in the case who granted the temporary restraining order, reveal that Anthem sees this “new DOJ” led by recently appointed Attorney General Jeff Sessions as the merger's way forward. “Our interest has been at the outset to merge. We reinitiated it over resistance. And here we are, later in the game, and we're fighting for it. And we're reaching out to DOJ,” Anthem's attorney Glenn Kurtz said of the merger, according to the transcripts. Anthem's lawyer pointed out that Vice President Mike Pence was supportive of the controversial merger when he was governor of Indiana, suggesting that Anthem is hoping the White House will have some influence over Justice Department officials. Indiana insurance regulators gave the Anthem-Cigna deal a thumbs-up last May. Anthem argued for the temporary restraining order enjoining Cigna from killing the merger agreement on the grounds that Anthem wouldn't be able to “negotiate a settlement, with or without divestitures, with (a) new DOJ" if there were no merger deal to negotiate. While Cigna argued that the deal is dead and impossible to resurrect, Anthem nevertheless was able to convince the court that it stands a chance under the new administration, and that allowing Cigna to terminate the merger agreement would prevent Anthem from exhausting every avenue to close the deal. Earlier this month, a U.S. District Court judge blocked the Anthem-Cigna merger on the grounds that it would harm competition in the national employer market. Anthem said it would immediately appeal the court's decision. But the next week, Cigna announced that it terminated the merger agreement and sued Anthem for almost $15 billion, saying Anthem breached the agreement. Anthem fired back with a lawsuit of its own and won a temporary restraining order that would stop Cigna from bowing out of the agreement. Another hearing will be held the week of April 10 to determine if Cigna can lawfully terminate the merger agreement after the deadline of April 30. The legal battle between Anthem and Cigna is the culmination of months of disputes that illustrate the deteriorating relationship between the companies over the 19 months since the merger was announced. 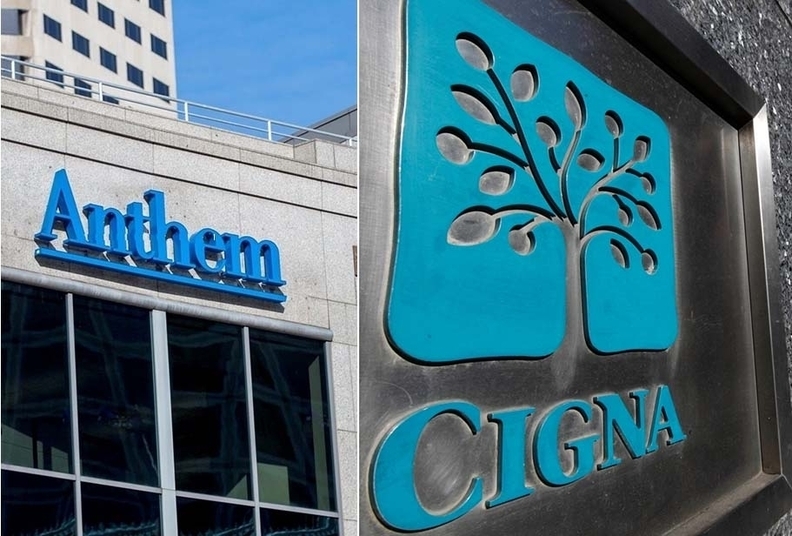 Anthem has claimed that Cigna tried to sabotage the merger at every turn. And Cigna has gone so far as to allege that Anthem—knowing the merger faced impossible odds—attempted to undermine Cigna as a competitor and steal away its customers, according to Cigna's complaint filed in the Delaware Chancery Court. Anthem is still clinging to the merger, which it claims will generate $2 billion in cost savings for its plan members, because of the millions in legal and consulting fees it has devoted to closing the transaction. Anthem so far has spent $520 million to obtain regulatory approval, and added another $120 million to that when it extended the merger agreement, according to the transcripts. Anthem and other health insurers have been in a race to gain scale so they can drive down costs and better negotiate rates with healthcare providers. During the teleconference, Cigna's lawyer claimed that Anthem “wants to keep Cigna on ice” so it will have one less competitor to deal with. But Cigna said there's no way the deal will gain approval in the short timeframe before April 30, and so, Cigna should be allowed to go free. Its complaint details many ways in which Anthem allegedly acted to benefit itself and other members of the Blue Cross and Blue Shield Association while undermining Cigna and mishandling the regulatory process. But despite Cigna's objections, there's reason to believe that Anthem and Cigna will have an easier time closing a merger under President Donald Trump's administration, which some attorneys expect to be more lenient when it comes to antitrust matters than the Obama administration was. While Trump has not yet made any appointments to lead the Justice Department's antitrust division, his transition team picks signal a return to a hands-off approach to antitrust enforcement. Additionally, Trump has shown a willingness to get involved in corporate dealmaking. In January, then-President-elect Trump met with the CEOs of Monsanto and Bayer to discuss their proposed $66 billion deal to form an agribusiness giant. White House press secretary Sean Spicer announced that the combined company would create thousands of new jobs, and Trump even tweeted support. Despite a potentially more merger-friendly government, some antitrust attorneys still see no chance that the Anthem deal will close. Matthew Cantor, a partner at law firm Constantine Cannon, said he doesn't see any way to remedy the lost competition that would result from the merger. Moreover, even if the Trump administration agreed to clear the merger, Anthem would still have to win over 11 states that also sued to block the deal. “Some of these plaintiff states, including New York, California and Connecticut, are being represented in this matter by Democratic (attorneys general) that I do not see agreeing to clear the deal,” he said. Cantor and other antitrust experts have given Anthem and Cigna little chance of winning in appeals court.